You are here: Home › Further Reading › JFK Assassination FAQs › Did Lee Harvey Oswald Shoot at General Edwin Walker? Did Lee Harvey Oswald Shoot at General Edwin Walker? Oswald was posthumously accused of having shot at Walker in April 1963, largely on the basis of a claim by his widow that he had admitted to the shooting. Against this, the only witness failed to identify Oswald, and the bullet was the wrong type. On the evening of 10 April 1963, Edwin Walker, a former Army general, was sitting in his study when a bullet entered his house through a window frame and struck the wall close to his head. Dallas police were unable to identify the gunman. The crime remained unsolved until shortly after the assassination of President Kennedy, when the FBI’s report presumed that Lee Harvey Oswald was the culprit (see Warren Commission Document 1, pp.20–22). The Warren Commission, unable to determine Oswald’s motive for shooting JFK, seized on the attempted shooting of General Walker as evidence of Oswald’s murderous tendencies (see Warren Report , p.183). For more than two months after the JFK assassination, Marina Oswald was held at the Inn of the Six Flags in Arlington, near Fort Worth, where the Secret Service and the FBI interrogated her and threatened her with deportation to the Soviet Union ( Warren Commission Hearings , vol.1, p.410). She produced several statements incriminating her husband, including the claim that on the evening of the attempted assassination of General Walker, Lee Oswald had gone out, leaving a handwritten note which explained in Russian what she should do if he were arrested. When Lee returned, he admitted to Marina that he had shot at Walker (for Marina Oswald’s account, see Warren Report , pp.405f). The Warren Commission was aware that many of Marina Oswald’s statements were contradictory and unreliable (see, for example, her evidence about Oswald cleaning and practising with his rifle). One of the Commission’s attorneys, Norman Redlich, wrote in a memo to J. Lee Rankin that “neither you nor I have any desire to smear the reputation of any individual. We cannot ignore, however, that Marina Oswald has repeatedly lied to the [Secret] Service, the FBI, and this Commission on matters which are of vital concern to the people of this country and the world” ( HSCA Report , appendix vol.11, p.126). Redlich expanded on this when testifying before the HSCA: “She may not have told the truth in connection with the attempted killing of General Walker. … I gave to Mr Rankin a lengthy document. … I indicated the testimony that she had given, the instances where it was in conflict” ( ibid. , p.127). While Marina was producing this incriminating evidence, an interesting coincidence occurred. Ruth Paine, with whom Marina had been staying at the time of the assassination, sent her a Russian–language book. Tucked inside the book was the handwritten note ( Warren Commission Hearings , vol.16, pp.1f [Commission Exhibit 1]). A Minox spy camera had been found in her garage among Lee Oswald’s possessions, but Ruth Paine claimed that it actually belonged to her estranged husband; see Carol Hewett, ‘The Paines’ Participation in the Minox Camera Charade,’ Probe , vol.4 no.1 (November–December 1963). She claimed to have found another document in Oswald’s handwriting, this time a letter addressed to the Soviet Embassy, which linked Oswald to a KGB agent in Mexico City ; see Jerry Rose, ‘Gifts from Russia: Yeltsin and Mitrokhin,’ The Fourth Decade , vol.7 no.1 (November 1999), pp.3–8. For more about the role of Ruth Paine in the JFK assassination, and her relationship with Marina Oswald, see the introduction to George de Mohrenschildt’s I Am a Patsy! I Am a Patsy! . Was the Walker Note Authentic? Ruth Paine’s home had been searched thoroughly on the afternoon of the assassination, and again the following day, when Paine claimed to have seen officers specifically looking for loose papers within books ( Warren Commission Hearings , vol.3, p.87). The inventory of items discovered is 49 pages long, but does not mention the note (FBI HQ Oswald File, 105–82555–24). Although the FBI’s handwriting expert considered that the note was in Oswald’s handwriting ( Warren Commission Hearings , vol.7, p.437), only one of the three experts who were consulted by the House Select Committee on Assassinations considered the note to be authentic ( HSCA Report , appendix vol.8, pp.232–246). The Bureau’s fingerprint expert found seven sets of fingerprints on the note. None of them belonged to either Lee or Marina Oswald (FBI HQ JFK Assassination File, 62–109060–36). There were no witnesses to the shooting itself, but one of Walker’s neighbours was alerted by the gunshot and saw two men leaving the scene. Each man got into a car and drove away. The witness, Walter Kirk Coleman, was able to give detailed descriptions of the men and their cars ( Warren Commission Hearings , vol.26, pp.437–441 [Commission Exhibit 2958]). After the JFK assassination, Coleman was shown photographs of Oswald. He denied that Oswald resembled either of the men he had seen. In any case, Oswald could not drive. Robert Surrey, an associate of General Walker, reported that he had seen two men acting suspiciously outside Walker’s house two days before the shooting. Neither man resembled Oswald ( Warren Commission Hearings , vol.5, pp.446–9). The bullet used in the attempted shooting of Walker was probably not the same type as those used in the JFK assassination. According to various newspaper accounts (e.g. ‘Walker Escapes Assassin’s Bullet’, New York Times , 12 April 1963, p.12), the Dallas police claimed that the bullet was a 30.06 calibre; the bullet shells from the Texas School Book Depository were 6.5mm. The Walker bullet was too severely deformed to allow a conclusive analysis of its pattern of grooves. A spectrographic examination by Henry Heilberger of the FBI laboratory found that the lead alloy in the bullet was different from that of bullet fragments found in President Kennedy’s car (FBI HQ JFK Assassination File, 62–109060–22). Dr Vincent Guinn performed neutron activation analysis on the bullet fired at General Walker, as well as several bullet fragments associated with the JFK assassination. He claimed that the Walker bullet was “extremely likely” to be a fragment from the same type of bullet as those fired at President Kennedy ( HSCA Report , appendix vol.1, p.502), but his methodology and results have since been refuted (see How Reliable is the Neutron Activation Analysis Evidence in the JFK Assassination?). The Walker bullet had been fired from a rifle powerful enough to send it through brickwork, which the Mannlicher–Carcano rifle was not. There is no evidence that Oswald ever had access to such a rifle. Not only did the bullet and rifle have no association with Lee Harvey Oswald, but Edwin Walker was adamant that Commission Exhibit 573, the bullet offered in evidence, was not the one he had examined at the time of the shooting; see Justice Department Criminal Division File 62–117290–1473 for Walker’s correspondence with the Justice Department on this matter. Oswald’s supposed motive for shooting at Walker was political. Walker was well known for his very right–wing views. He had been forced to resign from the Army for indoctrinating his troops with the ideas of the John Birch Society and for announcing publicly that President Truman, among other prominent American politicians, was a communist sympathiser (see Walker’s obituary in the New York Times ). Although the alleged presidential assassin was officially supposed to have been a communist, the known facts of Lee Harvey Oswald’s career show that he was closely associated with one or more US intelligence agencies, and that his pro–communist public persona was highly likely to have been a fake. 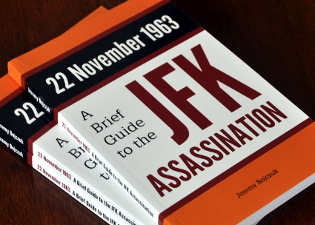 With no plausible motive and no substantial grounds for believing that Oswald was involved in the attempted shooting of Walker, and no strong evidence that Oswald was guilty of the JFK assassination, it seems that the Walker shooting was attributed to Oswald by the FBI and the Warren Commission purely to support the notion that Oswald was a leftist malcontent with a propensity for violence. Gerald D. McKnight, Breach of Trust: How the Warren Commission Failed the Nation and Why , University Press of Kansas, 2005, pp.48–59. Sylvia Meagher, Accessories After the Fact: the Warren Commission, the Authorities, and the Report , Vintage, 1992, pp.283–292.